AA seeks to help anyone who believes their drinking may be negatively affecting their life. They use the 12-Steps to help fellow sufferers in this age-old malady. Services offered in French and English. A fellowship of men and women whose goal is to stay clean from cocaine and other mind-altering substances, using the 12-Step Program. Services offered in French and English. English meetings: Wednesdays 7:30pm, 4615 Côte-Sainte-Catherine Road. Contact Andre at (450) 464-6771 or andregingras45@hotmail.com. French meetings: Thursdays 7:30pm, 5416 D’lberville Street. Contact Michael at (514) 773-1373 or mikepelligrin007@gmail.com. A 12-step based program helping with abstinence from crystal meth. Free and sustained by voluntary contributions. There are two meetings in Montreal every Tuesday and Saturday at 7:30pm. Depressed Anonymous offers everyone living through distress a helpline and free and confidential support groups. The one requirement for membership is a desire to stop using all mind-altering drugs. Regular meetings, using the 12-Step Program, seek to give members support. The only requirement for membership is a desire to stop gambling. The only requirement for membership is a desire to stop using marijuana. In addition to in-person meetings, MA also provides online and phone meetings. OA seeks to help anyone who has difficulties with food, be it over-eating, under-eating, over-exercising, or any other food-related problems. They provide weekly meetings in Montreal, as well as online and phone meetings. Social reintegration initiative for people temporarily unable to “function” in society. Counseling (with or without accommodations), short-term housing, support for independent living, and outpatient treatment. Open 24/7; bilingual. Psychosocial approach: crisis intervention, follow-up and counseling, and short-term housing. Serves mainly southwest Montreal (Ville-Émard/Côte Saint-Paul, Saint-Henri, Petite-Bourgogne, Pointe-Saint-Charles, Verdun, Lasalle, Lachine, and Ville Saint-Pierre). Bilingual phone service 24/7. Telephone intervention, counseling, short-term housing, and external crisis monitoring. Serves mainly east Montreal (Rosemont, St-Michel, St-Léonard, Rivières-des-Prairies/Pointes-aux-Trembles, Anjou, and Mercier-Hochelaga-Maisonneuve). Bilingual phone service 24/7. Short-term crisis housing (max. 14 days), community follow-ups (home or elsewhere), orientation and reference, telephone support, and intervention for non-voluntary clients. Services in Westmount, Parc-Extension, Côte St-Luc/Hampstead/Montreal-West, NDG/Côte-des-Neiges, Outremont (some areas), Ville-Marie (some areas), St-Laurent (anglophone population). Bilingual phone service 24/7. Crisis intervention, short-term housing, short-term crisis follow-up, and a reference service. Additional services for the deaf and blind. Serves mainly center-east Montreal (bordered by the Metropolitan Autoroute in the north, the Saint Lawrence River in the south, D’Iberville Street in the east, and Hutchinson Street in the west). Crisis line available 24/7. 24/7 crisis line that offers counseling, short-term housing, and telephone intervention, as well as post-crisis support and reference services. Mainly serves the West Island area of Montreal. Offers courses and workshops to help the young and the old master technology in the digital age, a state-of-the art computer centre, literary and educational events, financial literacy sessions, exhibitions on literature and history, a meeting space for community groups, and much more. CCE offers brief courses and workshops on career-related skills from marketing to business to web design. English. CTD offers both courses and training for career-related skills. English. Dawson College’s Continuing Education offers you many options for furthering your career, your knowledge, your interests, and your training. There is something here for everyone; you just have to choose what is right for you. This centre offers a variety of entry-level English courses provided in various languages. It also offers high-school, vocational, and CEGEP-level courses in preparation for university or your career. MCLL is primarily for people of retirement age who want to continue learning for the joy of it and share their knowledge, ideas, and experience with others. You will make new friends and have the satisfaction of being a student again in the surroundings of a famous university–with no exams! SCS offers a range of courses in language and career-related areas as well as humanities and culture. Refine your academic writing skills or learn to write for a specific professional audience with courses offered by the McGill Writing Centre (MWC). As a student in one of the MWC’s courses or workshops, you’ll learn essential skills, strategies, and techniques that will help you to succeed both at university and in any number of professions. Thomas More is an adult-specific educational institute. They seek to provide opportunities for meaningful learning and educational development to all. Of note is their Seniors Outreach Program that takes courses to seniors’ residences and centres. Vanier College offers a wide variety of continuing education. They also have a “Student For A Day” Program where you can sign-up to experience a class in the field of your choice. English. Seven-week workplace reintegration and maintenance programs for people with mental illness. Specialized employment services for individuals with mental health problems by referral. Provides workforce reintegration and counselling with a personalized approach. Free for those meeting their eligibility criteria (see website). Social integration for people with mental illness through the development of art careers for 18+. Workforce reintegration for people with mental illness, with volunteer opportunities. Provides vocational training, financial assistance, social support, job postings, student jobs, and labour market information. Integration/reintegration into the labour market. Job seeking tools and help, counseling, social services, youth support, and short-term crisis intervention. Career counseling, job search, vocational skill workshops, and aid in career marketing materials (cover letters, resumes). Job searches, workshops for artists and entrepreneurs, and interview skills. Social reintegration, housing, job search help, career counseling. Fringues & Cie: paid work experience and training in retail. Contemporary art gallery with seven exhibition spaces. The Biodôme, whose name means “house of life,” shows visitors the “true nature” of the Americas, by offering up their loveliest and most amazing ecosystems, with animals in these habitats. The Botanical Gardens of Montreal, one of the city’s jewels, is recognized as one of the world’s greatest botanical gardens. It offers a colourful program of events, exhibitions, and activities all year long. Permanent collection and special exhibitions in an amazing building. Centaur Theatre Company is a non-profit organization dedicated to creating, developing, producing, and presenting an array of plays. Award-winning exhibitions by incredible artists. If there’s a show on there, it’s probably a must-see! InfiniTheatre seeks out, develops, showcases, and brokers original plays from Québec and indigenous writers from across Canada. They have a playwriting competition and script development programs open to the broadest spectrum of local writers. The Insectarium, considered one of the largest insect museums in North America, celebrated its 20th anniversary in 2010. It is home to some 250,000 specimens of living and naturalized insects, an anthill, and many other exciting vivariums. This non-profit organization is devoted to performing arts such as francophone and anglophone theatre, contemporary dance, performance art, music, new artistic practices, and multidisciplinary shows that transcend boundaries. MainLine curates a variety of events and performances, such as theatre, dance, acoustic music, book launches, film screenings, readings, workshops, and art classes. Cultural centre with three exhibition halls and free artistic shows. The MMFA comprises paintings, sculptures, graphic arts, photographs, and decorative art objects displayed in four pavilions. 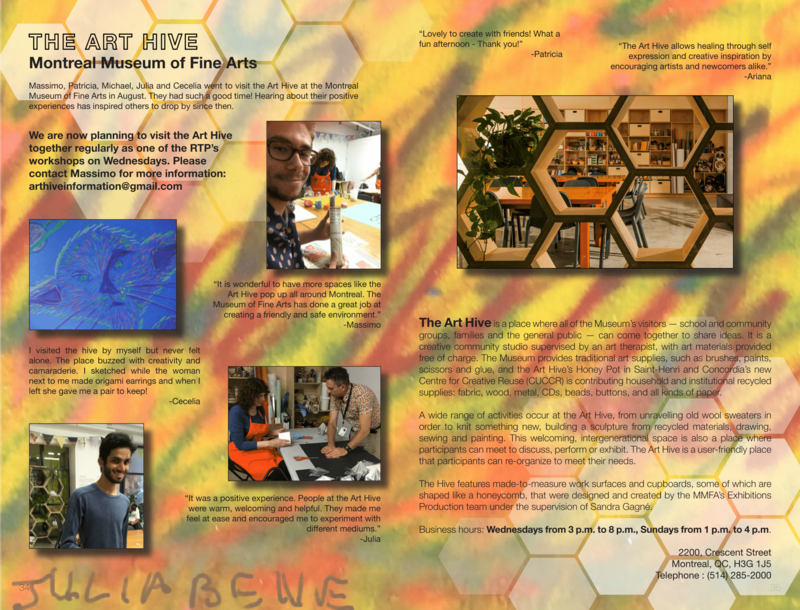 The Art Hive is a creative community studio supervised by an art therapist, with art materials provided free of charge. Open Wednesdays from 3-8pm and Sundays from 1-4pm. Click here to see photos/artwork from when our mentors attended! Visual art exhibitions, documentaries, workshops, etc. Live theatre, community workshops, and student shows. Includes an exhibition room, the Benny Library, a terrace, and courtyard with multidisciplinary programming: visual arts, theatre, dance, etc. The OSM is one of the major cultural organizations of the city whose name it bears with pride. One of Montreal’s leading contemporary art galleries with an international art scene. Local events, concerts, and art. Writing workshops and programs with events, prizes, and awards. The Rialto Theatre hosts many events such as parties, galas, shows, etc. The Segal Centre for Performing Arts is dedicated to nurturing, producing, and presenting world-class English-language theatre by the best professional artists from Montreal and beyond. Théâtre St-Denis offers a unique and inviting space conducive to a wide variety of shows, including comedy, singing, musicals, and many other high-quality performances and events. Art gallery and art school. Finance management workshops, budget consultation, and help with taxes. Services to low-income individuals: taxes, housing pensions, and healthcare. Information on Canadian employment insurance, temporary benefits, sickness, etc. For students, there is financial assistance available to those with a major functional disability and those with a serious mental or physical health disorder. See website for details. Government ministry for all information regarding government assistance. Tax services for NDG residents. An organization that advocates for the rights of unemployed welfare recipients. A website documenting the aid Quebec provides for purchasing of prescription drugs, who is eligible, and how to apply. Assistance in housing rights and welfare advocacy. Assistance, support, and rights information for people on welfare. Learn how to manage and reduce student loan debt. Housing, social reintegration, employment, financial advising, dining room, health services, clothing, and hygiene. Clothing and hygiene, meals, educational and social services, legal services, Inuit services, financial management services, and psychosocial services. Services women. New and second-hand computers and electronics offered at reasonable prices with a buying program for older electronics in good condition. Provides food services to the poor and hungry and healthy food baskets. Also has a meal program, cooking lessons, home-delivered meals, social integration, and education about poverty and hunger. Promoting the integration of people with mental illness and psychosocial problems through food delivery, catering, and training for kitchen-related careers. Community cafeteria offering daily complete meals for $2 or a monthly card with 20 meals for $35. Offers delivery services for elderly or isolated individuals. Has free social intervention services. Côte-des-Neiges habitants can receive a substantial food basket for $2. Affordable prescription eyeglasses for those on a low income. Inexpensive meals, catering, socializing and support, and training for kitchen-related careers. Food assistance, clothing bank, new clothing distribution, eyeglasses, medication program, material assistance, children’s aid program. The Face à Face Listening and Intervention Centre offers various housing resources as well as an accompaniment service for those in need. Open Monday-Friday from 9-5. This organization’s website provides many housing resources and specifies if they are for women/men/anglophones/francophones. Residence for homeless or at-risk men (Nazareth House) and women (Anne’s House) that provides support, meals, and clothes. A community organization that provides short- to long-term shelter for men 18+ facing homelessness, addiction, and mental health issues. Shelter allowance program: service providing assistance to low-income individuals, families, and seniors by offering housing wherein individuals pay rent equal to 25% of their income. Organization providing a range of services that respond to the needs of the homeless and at-risk population in order to enable reintegration into the community. Resources include shelter, food, clothing, and a rehabilitation program. There is also a 24/7 emergency service. Provides safe and affordable long-term housing for individuals with mental illnesses within an inclusive and supportive environment. Part of the Montreal Housing Project, Accueil Bonneau offers four houses with short-term, mid-term, and long-term solutions for people who are suffering from various problems related to homelessness (mental illness, addiction, etc.). Four forms of studio housing cater specifically to various circumstances, including assisted living. Facilitates the social reintegration of individuals experiencing mental health problems by providing a variety of services and activities that cultivate self-reliance on a daily basis. Private rehabilitation centre that offers housing assistance, child care, parental support, and counseling to families with children 0-5 years of age. The Forward House aims to provide individuals with the opportunity to learn how to cope with psychiatric difficulties as well as how to manage their lives more effectively and independently. Provides supervised apartments and services for individuals facing mental health problems. A rehabilitation house for both men and women 18+ with mental health and substance abuse problems facing homelessness. The house allows for a duration of stay up to two years. Must be referred by the Douglas Mental Health Institute or other hospitals. Services offered in both English and French. Provides long-term affordable housing with support services for individuals with mental health problems. Provides affordable long-term housing with psychosocial support for individuals living with mental health disorders. Also has three other residences: Saint Hubert (1034 Saint Hubert Street), Saint Denis (3670 Saint Denis Street), and Villeray (7787 Lanaudiere Street). The Lou Greenberg-Miriam Association provides community living, resources, and support for individual with autism spectrum disorders (ASD) and intellectual disabilities (ID). Provides temporary supervised group living for 6-9 months. Must be referred from the hospital. Services offered in English and French. Provides affordable and comfortable housing with community support services that enable members’ reintegration into the community. Check the website below for more information on the different programs offered and the programs’ phone numbers. Drop-in centre providing services to homeless and low-income people in downtown Montreal such as food and clothing, laundry services, shelter during the day, counselling, referrals to professional mental health and drug addiction counsellors, and employment assistance. Housing advice and rights information, protection of tenant rights. National group for housing rights and advocacy. Information on housing rights provided by the Government of Quebec in both English and French including documentation, forms, aids, legal advice, etc. Society responding to the needs of Quebec citizens. Offers a shelter allowance program which provides assistance to low-income individuals, families, and seniors. Emergency, short & long term shelter, family accommodation, meals. Free short-term housing and group living for women in difficult situations, crisis intervention, assistance finding long-term lodging. Emergency shelter for abused women, counseling for women and children, group/alternative therapy. Shelter for victims of violence, crisis line, counseling for women and children, post-shelter services, crisis intervention, accompaniments. Catering to all women facing difficult circumstances and/or homelessness, Le Chainon offers professional support in a non-judgemental environment. This organization’s website provides many housing resources for women and specifies if they are for anglophones or francophones. Herstreet promotes relational health and seeks to give homeless women and those in great difficulty the necessary resources that will enable them to regain power in their lives. The resources include a place to live that is secure and suited to their needs, an inclusive community of women, a warm environment, and accompaniment services and activities. Unconditionally welcomes the poorest women by providing them with temporary shelter and food and generally facilitating the social reintegration of single, homeless, abused, and struggling women. 24/7 services for women who identify as victims of domestic violence and their children, providing shelter, security, and support. Provides 24-hour support, help, and short-term housing for women and children who are victims of domestic violence. Member of the Fédération des Maisons d’hébergement pour Femmes. Largest resource for homeless women in Canada providing emergency services and psychosocial support. Catering to many of Montreal’s major ethnocultural communities, the Shield of Athena is a non-profit organization for victims of family violence offering emergency shelter and professional services to women and their children. A social reintegration program geared towards women facing difficult circumstances. Legal aid for those with mental health problems. Affordable/free legal aid depending on income, priority for certain people. Thirty-minute legal information sessions for women ranging from 0-$20 on family, immigration, civil, criminal, housing, and labour law. Offers anonymous, free, confidential, and bilingual support; information; and referral for those affected by drug addiction. An anonymous and free listening line for calls related to mental health, anxiety, depression, solitude, isolation, family problems, etc. The line is open seven days a week from 8am-midnight. There are also self-help groups held every Thursday from 1:30-3:30pm. The Face à Face Listening and Intervention Centre offers active listening, intervention, and collaborative support to vulnerable and isolated individuals, on the telephone and in person, to encourage the process of empowerment and social reintegration. Open Monday-Friday from 9-5. A helpline that welcomes each person as they define themselves, without telling them who they should be. It is in place to help those in psychological distress, loneliness, depression, anxiety, addiction, and anything to do with mental health. Open Monday-Friday from 9-5. You can also come in person from 9am-4pm. Provides information on Montreal services and health advice. An organization dedicated to helping those with anxiety, depression, or bipolar disorder. The helpline is free and open Monday-Friday from 9-5. There are also support groups throughout the week (schedules on site). SAM is a bilingual service open 24/7. Call if you are considering suicide, grieving, or someone is worrying you. It is also a line where you can talk freely about your concerns and receive concrete ways to help yourself and others. They provide in-person meetings that provide information about suicide and suicide prevention for French-speakers; however, one can call ahead to receive a print-out of the information in English or be referred to another organization. Tel-Aide’s mission is to offer a free listening service, in English and in French, which is anonymous, confidential, and 24/7. The service is accessible to everyone who suffers from loneliness or stress, who is emotionally distressed or angry, or who simply needs to confide in someone who will listen without judgment. Free, confidential, and anonymous listening line and reference service. They have a specialized listening service for the 60+ that can also provide individual meetings at home and senior discussion groups. Mental health/ psychiatry information, definitions, resources, and procedures. AQCID is a national association regrouping community and private organizations working in addiction. They provide information about addiction and referrals to other organizations. Information and statistics on Canadian addiction, plus education, publications and news. Provides information and education about mental illness and addictions. Provides many traditional Chinese techniques and therapies to help with body aches; numbness in fingers and toes; muscle tension; and sleep disorders including acupressure, acupuncture, and massage. A website that provides information on the benefits and how-tos of meditation. Yoga, meditation, vegetarian cooking classes, and breathing workshops. Christian community church offering various religious and spiritual programs for the Salvation Army Booth Centre’s residents, staff members, and local community. A Buddhist-inspired path to recovery from addiction. Meditation and mindfulness. Meetings at Yoga de L’Éveil on Fridays from 6:30-8:30pm and at Centre Soha on Monday from 7:30-8:30pm. An online resource that provides classes on Sahaja meditation. Some benefits of meditation may include a decrease in stress and anxiety, improved health, and a peaceful mind. Massage therapy and yoga. Newcomers are welcome–no experience or knowledge is required to participate. Classes offered in French and English. Online discussion and support groups for everything from addiction, anxiety, and allergies to physical injuries to trauma and women’s health. A coalition of seven different mental health and substance abuse organizations based in B.C. Online services include self-screening (for depression, anxiety, risky drinking, and substance abuse), mental health and substance use information (including causes, avoiding risky behaviour, myths, and facts, all specific to each mental health disorder), as well as personal stories. This website provides information about depression and anxiety. It answers commonly-asked questions about what mental illness is, the possible side effects of antidepressants, symptoms of depression, treatment, and more. This organization hosts 24/7 live chat rooms for those registered with Recovery Canada. There is also a full list of recovery tools and tips and an explanation of the recovery method, which is focussed on identifying and managing negative thoughts and feelings. Meetings on how to maintain focus and motivation to quit alcoholism, drug addiction, and other compulsive disorders; how to handle urges without acting upon them; and coping/positive lifestyle skills. 15 meetings/week over voice or chat, as well as a 24/7 chat room that offers a sympathetic ear to anyone who needs someone to listen. This website begins with a suicide prevention/friendship letter for those with depressed/suicidal thoughts in the hopes that his experience might reach someone. In addition, there is a Global Web Directory for carefully screened suicide prevention resources, a list of crisis centres, and many articles and resources on depression. A gym that has a cardio room, weight room, wellness centre, swimming pool, and tennis as well as private and group training. $30-40/month. Énergie Cardio is a gym that has group training, private training, a gym, and sauna. They have classes on power cardio, BodyPump, Body Design, Zumba, Sep, and many more. For under 25-year-olds, it is $25/month. They also offer a discounted $30/month membership for all. Check the website below for the closest locations and telephone numbers. Aerobics, fitness, yoga, pilates, dance, martial arts, spinning, weights, personal training, badminton, basketball, etc. To attend a class, you need to pay by the semester. Gym membership for the general public around $50/month. RSVP online to events run by hundreds of different groups in Montreal! For example, there are groups for Badminton, D&D, AI, Discovering the Outdoors, Singles Meetups, French conversation, and many more. Bilingual and volunteer-run, Randonnee Aventure promotes and facilitates group participation in outdoor activities in a social setting. Hiking, cycling, cross-country skiing, and snowshoeing are just some activities offered, as well as day trips to scenic areas in Quebec, Vermont, and New York. Annual membership is $25–try a trial trip before you buy! A cycling guide for Montreal! Has maps of beautiful bike rides, bike paths throughout Montreal, and a list of bike shops. The YMCA offers many sports: squash, badminton, basketball, volleyball, soccer, swimming, and more. Their classes include strength and cardio, dance, mind/body, yoga, spin, and pilates. Their community programs focus on senior activities, homeless assistance, housing services, and others. For more locations and telephone numbers, check out the website below. This organization has brought together 10 different health and social services in Montreal to provide rehabilitation centers throughout Montreal. Offers emergency detox services. See website for details and locations. French and English. Immediate services are available for those ready to take the next step in treatment of their addiction. They provide assessments and group counselling, treatment plans, referrals to other detox/rehab centers, or referrals to 12-step meetings. There is also a family support division and workshops during the week. Has inpatient treatment programs for substance abuse and gambling. A 24-hour bed facility with detoxification services and up to six weeks of intensive care. There are also outpatient services for the island of Montreal and in Montérégie. Drug addiction treatment based on the therapeutic community model: a participative, supportive, group-based approach to drug addiction rehabilitation. Therapy groups, activities, workshops, etc. Self-help groups to support mental health problems, depression, and isolation. Activities, workshops, women’s groups, and communal meals. Open to Pointe-Saint-Charles and neighbouring communities from Monday-Friday 12-9pm. AAMC provides support services and treatment for those living with HIV/AIDS and/or Hepatitis C. These support services include discussion groups, one-on-one support, dinner and discussion events (Mondays from 6-9pm), a buddy program, and more. The go-to reference list for all things mental health in Montreal. Weekly support/discussion groups, education, referrals counselling, mindfulness, and much more. Office is open Monday-Thursday 9am-5pm and Friday 9am-4pm. Immediate, specialized and free assistance for those with anorexia and bulimia. Support groups, family support, prevention activities, helpline (number below) and referrals. There is also an online chat group. Personalized outpatient program, individual sessions, and information on eating disorders. A day centre with self-help groups, discussion, sharing, and activities. Aims to maintain and develop the independence of people with mental health problems. A place of respect, exchange, and sharing in a friendly environment that is welcoming to all. Aims to improve quality of life to those living with mental health problems and to break cycles of loneliness and isolation. Provides entertainment, excursions, workshops, yoga, support, education and more. Priority to Côte-des-Neiges residents. Educational and recreational workshops on arts, nutrition, exercise, cooking, budgeting, etc. Services include home visits, outings, and celebrations. Offers friendship from volunteers to people with mental health problems. Links to community resources such as housing and legal advice. Community-based mental health services and community center focussed on life and job skills, job placement, and social activities. A small group of former GEH clients, providing peer support, exploring lifestyle, issues of wellbeing, and encouraging abstinence. Meetings Monday and Friday 6:30-7:30pm. Art, music, dance, and cartoon workshops run by professional artists or art therapists. For creators eager to heal and develop their art. No experience necessary, only interest. By referral. Mental health support groups, training sessions, events, etc. Community health-focussed peer-run support groups to help manage thoughts and behaviors that lead to stress, fear, and depression. Self-help mental health based on neuropsychiatrist Abraham A. Low. Free. Check website below for contact information and meeting details. An organization dedicated to helping those with anxiety, depression, or bipolar disorder. The helpline is free and open Monday-Friday from 9-5. There are also support groups throughout the week (schedule on website below). Meetings on how to maintain focus and motivation to quit alcoholism, drug addiction, and other compulsive disorders; how to handle urges without acting upon them; and coping/positive lifestyle skills. Clubhouse/centre for outpatient mental health and drug rehab. Support groups, life skills, psychoeducation, experiential therapy, as well as social and work reintegration. Help with housing, employment, and education, etc. Free membership. Psychotherapy for individuals, couples, and families including treatment for mental illness, addiction, and eating disorders. Affordable individual cognitive behavioural therapy for depression, anxiety, OCD, addiction, and more. Intensive treatment program for adults 18 and older. Reference needed. Services offered in English and French. Centre for psychotherapy and mindfulness meditation to help overcome stress, anxiety, depression, anger, and more. Individual, couple, and family counselling headed by Sandra Reich, specializing in many mental health issues. Counsellors and therapists offering psychotherapy, couple and family counseling, divorce service, hypnotherapy, and life coaching. A search engine of volunteer opportunities in Montreal. Note: Many of the resources listed here have volunteer opportunities. If there are any that seem interesting and important, check the website for volunteer opportunities. Medical detox provided by appointment. Clients can self-refer. Opioid dependence treatment, psychosocial intervention, acupuncture, and much more. Addresses the needs of opioid-dependent persons. Call for more information. By appointment only. Directory of Montreal Withdrawal management services. Detox centre: in-house residence, rehab, counseling/workshops, and anonymous meetings No opiate withdrawal /detox services. Please call to determine suitability.